I became interested in antique tools in about 1983. My interest narrowed to Stanley tools in approximately 1985. At this time I was fortunate to become acquainted with Roger K. Smith and purchased his book entitled Patented Transitional and Metallic Planes in America 1827-1927 published by the North Village Publishing Company in 1981. This began a long period of communications and Stanley tool purchases with Roger. I vaguely remember him telling me that my plane purchases were going toward supporting his children’s college expenses. Roger was extremely helpful in my passion of learning more about antique planes, their use and history. The history of the Stanley Tools companies is well documented and I would encourage you to explore the details of the evolution of this company. What I am presenting in this video is background information on the Stanley No.1 smoothing plane. In future videos I will discuss the other planes in my collection. I started out trying to collect one example of each Stanley plane type. This proved to be very difficult and extremely expensive, so I randomly added to my collection over a period of ten years. In the photo below you can see the trademark on the iron of one of my Stanley No. 1 planes. The video will show you more photos of this particular plane. This V shaped logo on the iron is identified in Roger’s book as a Type 11-1910-1920. There appears to be a ‘B’ on the frog and lever cap, a forging mark for an unknown foundry which showed up on Stanley planes from 1899-1902. This would indicate that the plane may be older than the iron’s trademark would indicate. The spring under lever cap became rectangular in 1869 and was banjo shaped prior to that. The other trademark showing on my other number 1 plane’s iron dates that iron from 1907-1910. There are no other marks on this plane. The Stanley no. 1 smoothing plane was manufactured from 1867 until 1943. It is 5 ½ inches long with a 1 ¼ inch wide blade. It is constructed of cast iron with a rosewood handle and knob. The finish is generally Japanned. These planes can sell for anything from $1000 to $2000. There are counterfeit versions of this plane so the buyer must beware!! “Without doubt the most famous of all Stanley planes never had a lateral adjuster, never had any number markings. Some models have B or S cast into the bed, others have no markings whatsoever. Early types have a beaded rosewood front knob and a short handle spur. Later types have a slightly longer handle spur and a lever cap embossed with the Stanley name. “Stanley tools represent a major category of collectible tools, and can form the basis for a rewarding and stimulating hobby. 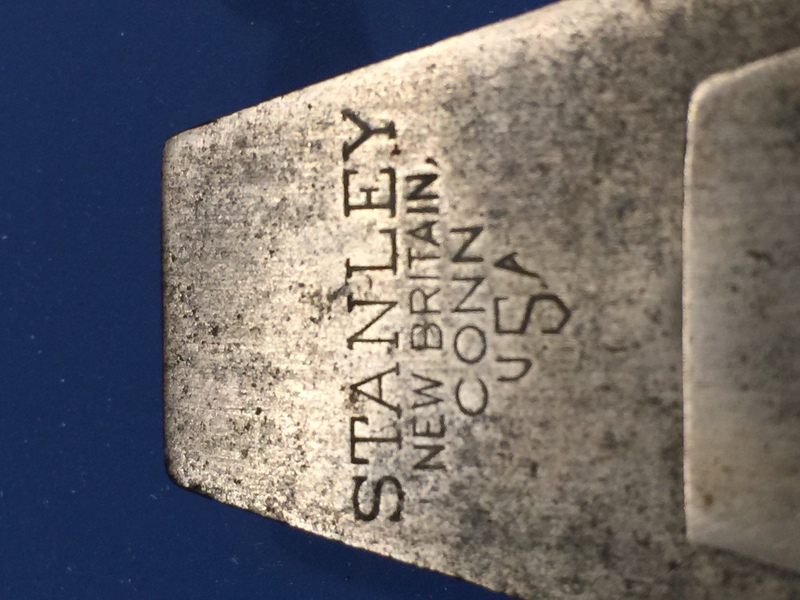 One of the most desirable of Stanley tools for the collector is the diminutive Stanley No. 1 bench plane. This tiny, 5-1/2” long plane poses some interesting mysteries for the collector. First, what was it used for? It’s so small-that even a craftsman with a small hand finds it uncomfortable to use. And second, for a tool that was manufactured in abundance over a 73 year period (1870-1943), why should it be so scarce? As to the first mystery-its size-the explanation is relatively straightforward. 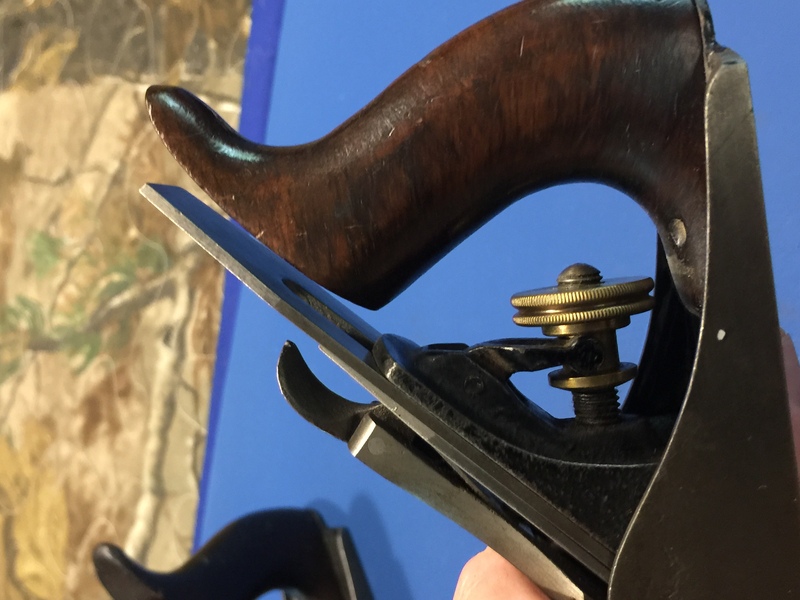 These planes were designed for use by elementary school woodworking classes, and were used in the introduction to the proper care and use of woodworking planes. The second mystery requires a more hypothetical explanation. With the advent of U.S. involvement in W.W. II came the need for scarce raw materials by factories involved in the rapidly increasing war production industries. Those with memories reaching back that far remember that not only were civilians in general involved in paper and fat saving drives, among others, but schools and other institutions also were called on to collect and donate large amounts of scrap material. The widespread draft also was a factor. Shop teachers, especially at the elementary school level, came into short supply overnight, thus freeing up the tools and materials formerly used in their courses as vital scrap. Since the majority of No. 1 planes produced were to be found in schools, a large number of these planes were absorbed by the wartime scrap drives. In my next video, I will discuss the Stanley No. 2 plane. I will also discuss the January 3, 1985 letter I received from Roger K. Smith detailing his approach to restoring and caring for transitional and metallic planes.